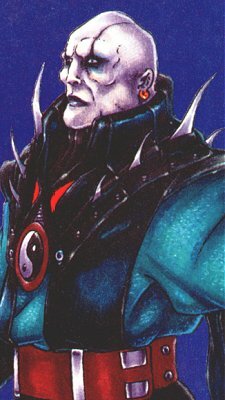 Quan Chi was a free-roaming sorceror, able to travel the various planes of reality without detection from their protectors. Over the centuries, he gained great power, and also knowledge of the plight of Shinnok . Shinnok was a fallen Elder god who had been trapped in the Netherrealm. Quan Chi offered to free Shinnok and aid him in taking over the Netherrealm, in exchange for more power when they escaped. Shinnok agreed, and with Quan Chi's help took over the Netherrealm. Quan Chi then set about to free Shinnok from the dead realm. Centuries passed, and Quan Chi had exhausted all methods of freeing Shinnok. It was then that he was approached by Shang Tsung, another free roaming sorceror. Shang revealed to Quan Chi the location of the Map of Elements, which could lead to the amulet which had previously allowed Shinnok to travel from realm to realm. In exchange for this information, Quan Chi aided in the resurrection of the Outworld queen Sindel. Traveling to the Earth realm, Quan Chi hired Sub-Zero to retrieve the map for him. As insurance, he also procured the services of Scorpion, a member of a clan that rivaled Sub-Zero's. Sub-Zero found the map first, and as a reward Quan Chi destroyed Scorpion's family and clan. Even though he now knew where the amulet was, because it was guarded by elemental gods he could not go after it himself. He hired Sub-Zero to recover the amulet, and when it was delivered to him he rushed back to his Netherrealm stronghold. He had waited a long time for this moment, because he had his own plans for the amulet. In his stronghold, he created an exact duplicate of the amulet and presented it to Shinnok. Then, using the power of the real amulet, he tricked Shinnok into believing that the fake amulet was genuine. However, Quan Chi's plans were upset by his own treacherous underlings. Sub-Zero, learning of the amulet's true nature, had ventured to the Netherrealm to reclaim it. Quan Chi found himself betrayed and defeated by one of his own assassins and Shinnok was defeated, as well. Sub-Zero returned the fake amulet to Rayden, and it was believed that Shinnok's threat was over. Years passed, and the Outworld ruler Shao Kahn made an unsuccessful attempt to annex the Earth realm. Realizing the Outworld as a weak link, Quan Chi used the magic of the amulet to open a portal to the realm. Shinnok's armies overtook the realm and improved their power base. This gave Shinnok enough power to challenge the Elder gods, and Quan Chi led the attack against the anceint protectors. Victorious again, Quan Chi set his sights on Earth. A group of Earth warriors oppossed Shinnok's armies, and Quan Chi took the opportunity to oppose his evil master. To Shinnok's surprise, Quan Chi produced the real amulet, which he used to destroy Shinnok. Quan Chi then turned on the Earth warriors, but lost the amulet to Rayden. Facing off against the brother of Sub-Zero and a reincarnated Scorpion, Quan Chi fell in defeat. Scorpion, learning that Quan Chi had been responsible for his clan's deaths, slew the evil sorceror. Quan Chi found himself once again in the Netherrealm, but this time in the Prison of Souls, forever incarcerated.